Hotel Lawyer on the state of the hotel industry. At the ALIS conference last week, Smith Travel gave a great overview on the final results for 2010 as well as its outlook for 2011 and 2012. The numbers are very interesting! Jan Freitag made the presentation at the ALIS conference. According to him, at the end of 2010, there were 52,000 hotels in the United States providing a total room supply of 1.7 billion rooms (a 2% increase in supply over 2009). Great increase in demand. The demand for room nights grew a staggering 7.8% returning to the pre-bubble peak of 1 billion room nights sold during 2010, but with an increased supply of hotel rooms taking a share of the demand, occupancy only increased 5.7% to 57.6%, below the magic 60% occupancy level. Smith Travel hailed the demand growth, but noted that it does not expect to see this outsized growth again in the foreseeable future. In fact, as noted below, demand growth for the next two years is projected to be below 2% per year. Disappointing lack of any meaningful rate growth. Unfortunately, the dramatic demand growth was not accompanied by a comparable increase in the average daily rate or ADR. In 2010, ADR was flat (actually down -0.1%) at $98, and still below the important $100 level. RevPAR increased 5.5% to $56.50 and room revenues increased 7.6% to $99.5 billion. But 2011 and 2012 look to be years with strong ADR and RevPAR growth as shown below. 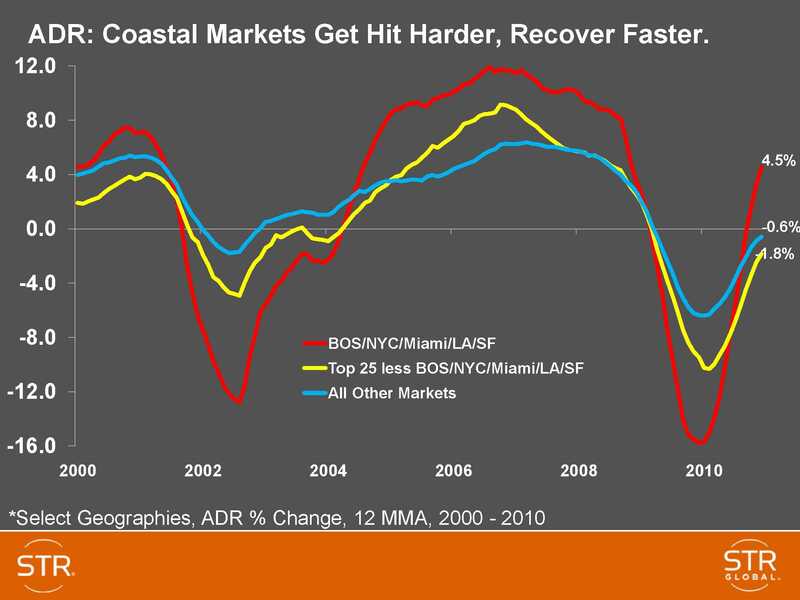 Coastal markets were hit harder and are recovering faster. While all markets have suffered and recovered on the demand side of the ledger, it is notable that the coastal markets have been hit harder and have recovered faster on ADR. 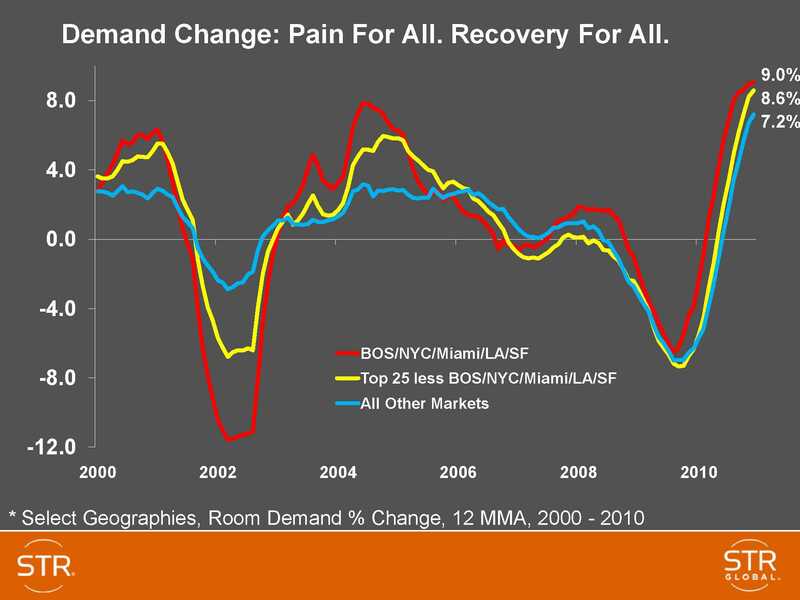 The following charts demonstrate this point, with the red line showing the Boston-New York City-Miami-LA-San Francisco markets. What lies ahead? The Smith Travel forecast. And here is how Smith Travel sees the future by chain scale segment. Forecast by industry segment. As we have discussed many times, all hotels will not benefit or suffer equally. 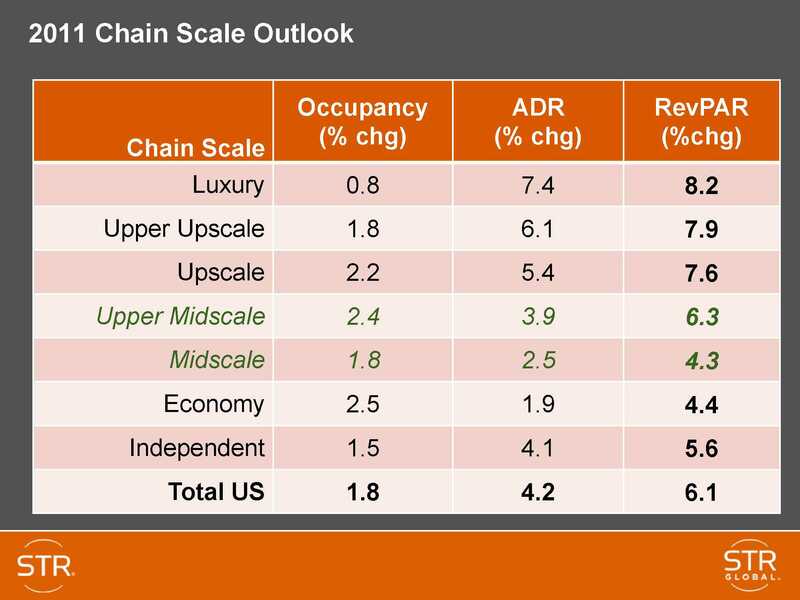 Chain scale segmentation is only one of the factors helpful in evaluating investment prospects, along with many other critical factors such as the specific geographic market the hotel is in, and the size, nature, condition, branding, and management of the property itself. But here is what Smith Travel projects for the next two years by chain scale. We continue to believe that 2011 will be a pivotal point in hotel investment with accelerating workouts, purchases and sales, and financings. The worst is behind us. Fundamentals are improving. Liquidity is returning to the marketplace and capital is poised for investment. This will be a busy year with strong increases in hotel values and performance. Other anticipations of Great Expectation! Ask the Hotel Lawyer: 2011 is starting as the year of “Great Expectations” for the hotel industry! Hotel Lawyer: So, You Think You Want to Buy a Hotel?